Believe it or not, the deer camps of television pros aren't too different from the ones most viewers are probably familiar with each fall, especially when it comes to pranking! In the thorny wilds of Texas, there's a prank that often gets pulled on newbies, unsuspecting visitors to a well established deer camp that has a serious collection of practical jokers hunting in the midst of prickly pear cactus, mesquite trees, and Muy Grande whitetails. What's the ruse? Well, let's just say that it involves a rattlesnake (often one that got too close for comfort to the camp's back door), a soda pop cooler, and some string. All that's left to do after a hard day of hunting is to set the trap, sit back, wait on someone to get a little thirsty, and then get ready to laugh, Texas big. Apparently, such pranks aren't exclusive to the Lone Star State. "I'm not much of a prankster," said UNCHARTED host Jim Shockey, possibly with a far away gleam in his eye. "I prefer quick wit and lively, intelligent banter (in camp) to pulling practical jokes," he continued. "But I have been known to put muddy rocks, wet seaweed, live poisonous snakes, hornets nests, and fire ant colonies in my hunting buddy's sleeping bag!" With friends like that ... well, you know how the rest of that saying goes! And apparently, Shockey isn't alone in his brand of deer camp pranking humor. "Australia is well known for its multiple species of deadly snakes," said Rob Fickling, host of Beyond the Divide. "I have an exact replica of a deadly tiger snake that is cast from a rubber mold. We use this (fake snake) to scare the daylights out of guest hunters, particularly those from overseas!" Speaking of snakes, there's a story that Country Roots co-host Ronnie "Cuz" Strickland likes to tell. "Yeah, once while hunting with Will Primos at his old camp called Rattlesnake, I was going to cook for some guests that we had down," said Strickland. "I started a fire in the old barrel cooker and sat down on the porch while the coals got right." "Well, I fell asleep," continued Cuz. "And then I woke up to a really big grass fire that had been started by the charcoal pit, one that was spreading fast! "I woke Will up, who was inside, and shouted to him to get some water. So he ran outside to this huge blaze with a small glass of water and threw it on the fire! "I guess at the time it was not too funny, but looking back on it now and seeing him with that one tiny glass of water against a big fire, it's hilarious!" Ralph Cianciarulo, ever the funny guy as he co-hosts Archer's Choice and The Choice, has his own humorous hunting camp stories to tell. Including one about the time that his wife stole the show...or is that the caribou? "We were hunting up in Quebec for caribou and Vicki shot a (really) great bull," said Ralph. 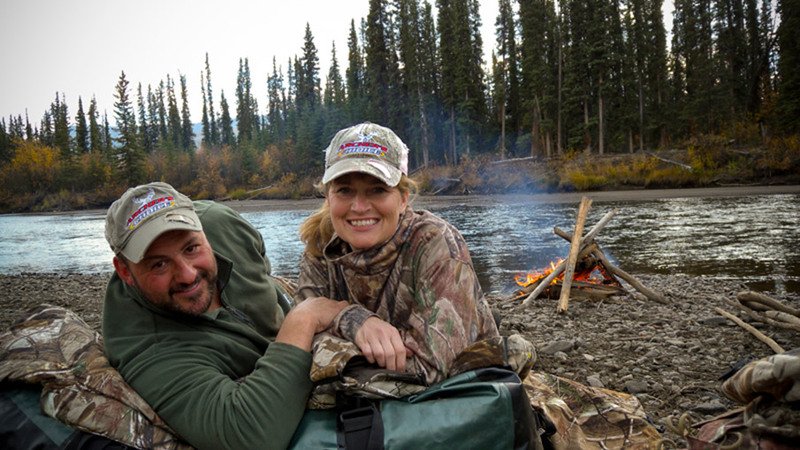 Knowing what a good bow shot Vicki is out in the field, that doesn't exactly tickle the funny bone Ralph. "Well, it ran a ways and went past Michael Waddell, who was also hunting up there," chuckled Ralph. "And as he (Waddell) was setting up for the shot, the caribou bull just fell over and dropped. "Michael didn't know what the hell had happened ... until he saw Vicki's arrow (in the caribou's chest)." Any other funny stories to tell from camp, Ralphie? "Well, there was the one time I remember back in the late 1980s when I was hunting up north for caribou with my friend and football idol, (the late Chicago Bears Hall of Fame running back) Walter Payton," said Ralph. "We were going through some rapids and he was super nervous," he continued. "And he asked me if I thought we were going to tip over (in the boat). I said to him 'If we do, just hold your arms straight up in the air!'" A puzzled Payton asked Ralph why. "Well, he had a presidential Rolex watch on with diamonds on one wrist and his number 34 bracelet made of gold and diamonds on the other wrist," said the Illinois resident and Bears fan Ralph. "I told him that if he went in, I'd grab his jewelry first!" What did the legendary NFL running back - known to millions as "Sweetness" - say to Cianciarulo's humor? "Well, I can't tell you what he said, but it would sure get bleeped out of a TV program, that's for sure," laughed Ralph as he fondly recalled the hunting moment with his late hunting camp pal. If it sounds like Ralph likes to joke in a hunting camp, well, that's correct. "I think my best all-time prank was when we were stalking javalinas one time out in Arizona," chuckled Ralph. "Well, one night, we Crazy Glued one of the guy's arrows in his quiver." The next day, when the first chance to arrow a bristle pig came around, the laughter soon followed. "That next day, he went out and he couldn't get an arrow out of his quiver for a shot!," smiled Ralph. "Boy was he pissed, but oh my, we still laugh about it to this day!" Speaking about laughing to this day, Trevon Stoltzfus of Outback Outdoors chuckles quite a bit when he tells a story about when the tables were turned on one of the funnier guys in hunting. "Fred Eichler is known for his practical jokes," grinned Stoltzfus. "A few years back, we were in camp hunting whitetails in Kansas with Ted Jaycox. Well, there were some other guys in camp that had brought a gorilla costume with them. "One night, Fred was the last one to come in from hunting and we dressed up one of the guys in the gorilla suit and had him hide in the barn, which was pitch black," he continued. "When Fred pulled up and got out of the truck, Ted asked him if he could help him move an old fridge into the barn on a two-wheel dolly. Well, Fred being the kind of person that he is, he jumped right in and grabbled the dolly and wheeled the fridge into the pitch black barn." "After Fred set the fridge against the wall (in the darkness), the gentleman wearing the gorilla suit stepped out from his hiding place and quietly hid behind him," laughed Stoltzfus. "When Fred turned around, he found himself fact to face with what I can only believe Fred thought must have been a monster!" "The guy emitted a low, menacing growl and Fred screamed like a small girl and ran out of the barn while the rest of us were rolling on the ground laughing," said Stoltzfus. "It was one of the funniest things I have seen in my life!" Maybe so. But something tells yours truly that somewhere near his Trinidad, Colorado, ranch home, Eichler is quietly scheming up his own prank for a little deer camp revenge. And the guess here is that it will be a doozy, one that brings a guffawing round of belly shaking laughter, the kind of funny bone tickler that deer camp seems to bring!